I thought I was already a bit excessive with my Ergo 360, Moby, and Maya ring sling. Turns out there is a huge and confusing world of woven wraps out there, complete with its own underground community, (I’m just waiting for the corresponding Portlandia episode). I discovered its existence through a friend. 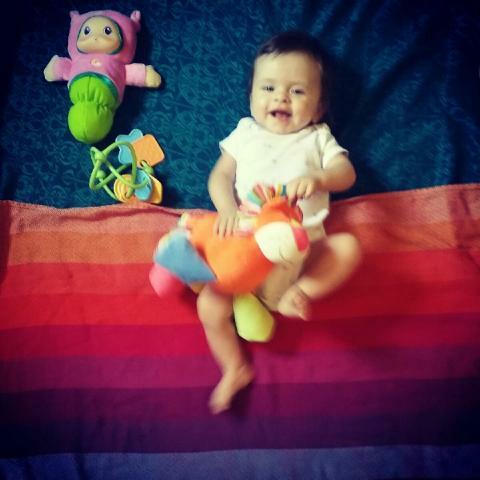 She let me borrow her beautiful rainbow Girasol (pictured above) and added me to a local Facebook group of babywearers. Getting ready to put these new wraps to work! Today I officially joined the club. My birthday present from my husband arrived early, two beautiful woven wraps. One for beating up, the other for special occasions. His words, not mine, although I’m pretty sure I’ll still manage to beat up both of them. As much as I wanted to fight the desire to buy another expensive baby carrier, I got sucked in. I love scarves. These are even prettier and at least there is the justification of different carriers for different situations, and wovens are way more comfortable than anything else for a heavier baby, at least in my opinion. The funny thing about babywearing is its decidedly hippie roots. I was sold as soon as my doula had me read Liedloff’s Continuum Concept. It only makes sense that babies are happier skin-to-skin, attached to mom after spending nine-plus months on the inside. What I did not expect was a huge market for fancy woven wraps. Women with “stashes” and used beauties selling in the high hundreds and even thousands of dollars. In other words, hippie capitalism. 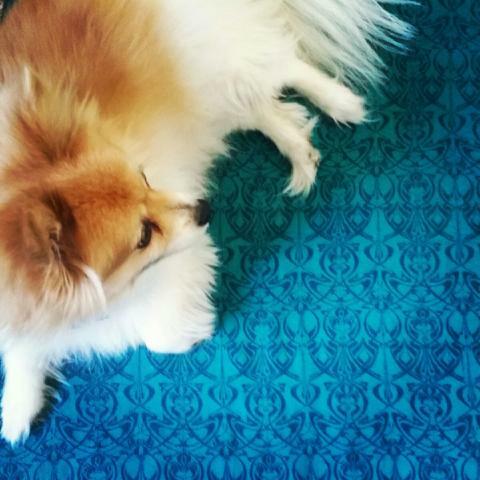 Pretty sure Pomeranians are not recommended for breaking in a new wrap. At first I scoffed at the price tags and huge collections, but the more I read, the more I at least kind of got it. While collecting a large stash will probably not become my thing, wraps make priceless family heirlooms and in many cases hold or increase in value, negating the high up-front cost if sold later down the road, (often a broken-in wrap is worth more than a new one, counterintuitive, I know). People buy expensive shoes and bags and… Why not hand-crafted, organic baby carriers? Which brings me to my first adventures in joining the club. After a couple weeks of Facebook stalking the group page and Internet research, I sent my husband a couple brands I liked. 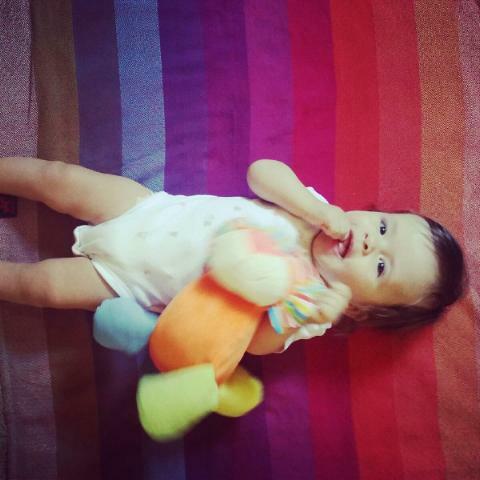 Seemed simple enough, but there are a million opinions out there and different materials make for different grips and levels of support for babies of different weights and different lengths for different holds… In other words, it is really confusing! He ended up buying me a Girasol and an Oscha. What I love about both these wraps is that they are fair trade pieces of art, one woven in the mountains of Guatemala, the other in Scotland. Even though the Girasol showed up with a tiny pull in the fabric, I realized it was just part of the charm of buying a hand-crafted good. I also immediately understood why people buy used wraps. My friend’s wrap was already broken in and cozy, these were a bit stiff and did not smell like home, so straight to the wash they went. 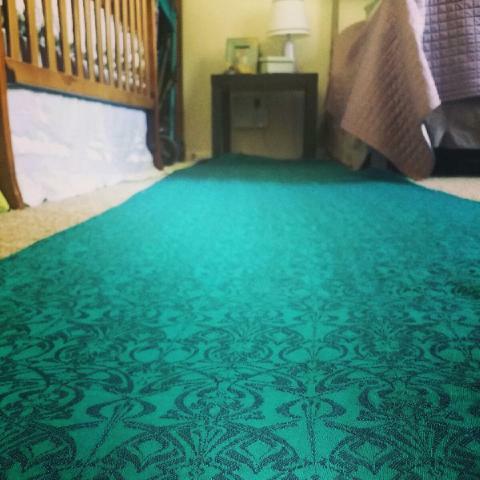 The Oscha actually dried nicely when laid out on the carpet (after I rolled it in dry towels). So, there you have it. 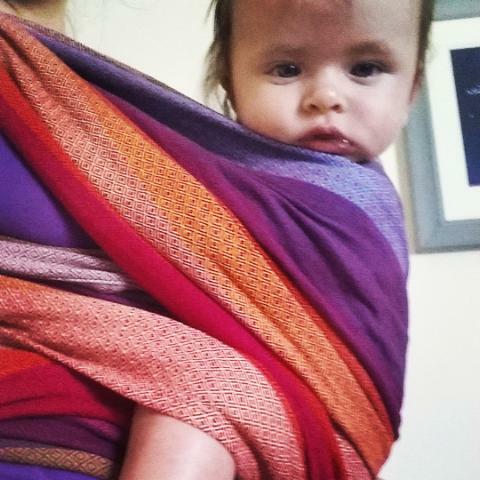 My first adventure in woven wrap babywearing without actually wearing a baby. Just a healthy dose of preparation. Go figure. Success! This woven is already comfortable and supportive. Yes, not sure how that goes along with our willingness to sacrifice for me to stay home, haha. I have just ordered my very first wrap too!!! So excited but not really got a clue…Your wraps are beautiful! Thanks, Vanessa, I feel the same way– not really sure what I’m doing, but loving it all the same!